Kitchen Tile Mural "Bread and Wine"
Handcrafted kitchen tile mural for a backsplash wall in old European style. Decorative red clay tiles from Mexico with "Bread and Wine" 16 x 12 inch design in brown, yellow and green on a white background. 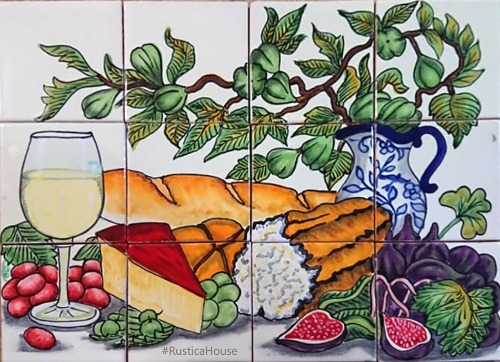 This handcrafted kitchen tile mural is available painted on 4x4 or 6x6 talavera tiles and free delivery to Mexico, and the US. I am glad I found this tile mural. It is a centerpiece decorating my kitchen backsplash wall behind my stove. They agreed to make changes to the size and painted it in custom dimensions. In fact, I needed it wider than higher and that what Mexican-tile did. Thanks for a wonderfully hand painted piece of mural tile art. Kitchen Tile Mural "Grapes and Apples"
Kitchen Tile Mural "Sunflowers and Calla Lilies"